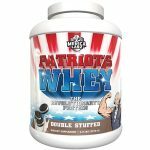 Deal Categories: Protein Powder and Pre Workout Products.Stores: Campus Protein. 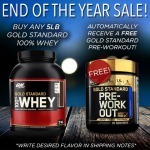 Year end sale at Campus Protein. Buy Whey Gold Standard (5LB – 7 flavors) for $58.99 & a full size Gold Standard pre workout (30 serv) will be added to your shipment (NOTE: you will not see it in your cart). Add the flavor you want for the PWO in the shipping notes. Shipping adds $7. Even with that this is the lowest total shipped price we could find right now for these 2 products by at least $18. Deal Categories: Protein Powder and Vitamin Shoppe Coupons.Stores: Vitamin shoppe. The price on the Gold Standard 100% Whey 2LB, drop from $29.99 to $14.99 at Vitamin shoppe. 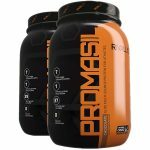 The price for 2 tuns of the 2LB Rivalus PROMASIL Whey (4LB total) drops from $59.99 to $29.99 at Supplement Hunt. Use coupon Rivalus2x2 during checkout. Rated 9/10 on Amazon and everywhere else.